MBARARA – Councillors for Mbarara Municipality have locked horns with the municipal executive committee led by Mayor Robert Kakyebezi and technical team led by Town Clerk over the new designs being implemented at Mbarara Round-about. The Social Media has been awash with public debates concerning the new erected Chinese lights-like cow monument at the round-about saying it does not reflect the true representation of Ankore heritage. 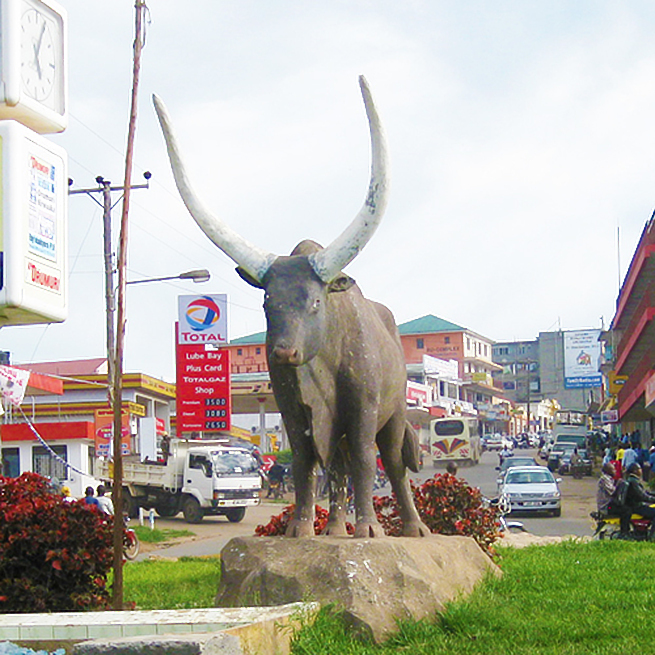 On Monday, March 25, the contractor of Abubaker Technical Services and General Supplies which is working on the beautification of roads in the town erected over nine poles disguising as the traditional cow. Following this, a cross-section of members from Ankole has already started a campaign dubbed “Restore Rusiina Campaign’’ to exert pressure on the leaders of Mbarara Municipality to reconsider putting the cow not lighting metals. A WhatsApp group named “Restore Rusiina Campaign” has also been created to generate views among people of Ankore on the development. On Tuesday, March 26, the LCIV councillors during their council meeting vehemently rejected the ongoing installation of cow-like lights saying they are fake and are a shame to the municipality. The round-about was named “Amahembe g’Ente” due to the sculpture of an Ankore cow that was put as a true definition and symbol of Ankore region. Mr. David Nahurira, the chairperson for works and development committee while presenting a report, noted that the committee has not seen the designs of the on-going construction at Amahembe g’Ente round-about. “The committee recommends that the executive committee shows us these designs and cost estimates in this council today since the work is ongoing,” the report reads, in part. During the discussion on the matter, councillors led by Mr. Muhamad Byansi representing Nyamityobora Ward B in Kakoba Division, noted that they were surprised to see the construction and installation going on without the council’s knowledge. This stirred up a heated debate as councillors demanded for an immediate explanation from the mayor who had nothing to say but rather asked the deputy town clerk Mr. Richard Mugisha to help him in explaining the matter. However, Mr. Bonny Tashobya Karusya, the Speaker ruled on the matter that the ongoing works at Amahembe G’ente should stop with immediate effect until when the designs and estimates are tabled before council for approval. “This matter does not need someone to be a technical person to see that you have fooled us… go and tell the contractor that as council we have ruled that the ongoing installation of those lights should be stopped, remove the ones already erected so that our original cow is installed,” the speaker said. In an exclusive interview with the secretary for works, Mr. Muzamir Ssekajja who sits on the executive committee, he told PML Daily that they have plans to install a very good modern cow that is being worked on.